This is just absurdly cool. 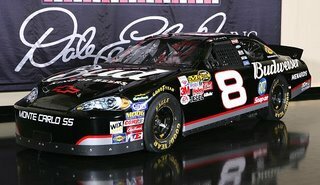 Dale Jr. (along with his teammates) are going to run Dale Sr.'s paint scheme at Talladega this weekend as a tribute to Sr. since it would have been his birthday this week. Let me be the first to say that this will be the highest selling Die-Cast car of all-time. This is going to be the "Tickle Me Elmo" of die-cast cars (and yes, I have to have one...call me white trash if you want). Can't wait to see the famous black car back on the track! You're white trash! Can you get one for me? Ha! Yes, if I can ever track down the die-casts, I'll pick one up for you. I can't imagine it'll take too long to get em out on the shelves. The New York Yankees of Hockey? ?